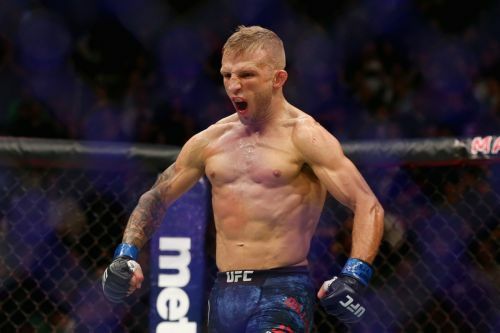 UFC Bantamweight Champion, T.J. Dillashaw seems to be increasingly confident with each passing day, ahead of his championship clash against current Flyweight Champion, Henry Cejudo. Dillashaw feels that Cejudo is 'scared,' and is becoming aware of the magnitude of the event, as he approaches the mega-fight on Saturday, in the UFC's first instance on the digital streaming platform, ESPN +. Leading up to UFC Fight Night 143, a very meticulous procedure drove the entire weight-cut process for the 135-pound champion, T.J. Dillashaw, who was going to shed an extra ten pounds to take on Henry Cejudo for his UFC flyweight belt. Sam Calavitta, the Performance Specialist at The Treigning Lab in Orange County, California, was the first to suggest Dillashaw and team with the idea of chasing the 125-pound belt. Calavitta was a former calculus teacher and mathematician, who has helped Dillashaw and fighters alike such as Aaron Pico and Juan Archuleta, extract the most out of their fighting potential. Calavitta, along with Dillashaw, put together a sophisticated plan to approach the weight-cut procedure with utmost care and precision, throwing the stereotypical methods of salt baths and starvation, out the window. Dillashaw now looks ready to take on his upcoming challenge against Cejudo, at the Barclays Center in New York, this coming Saturday on 19th of January, 2019. "Henry Cejudo wanted to call me out after the fight. He said he was going to come up to ’35 to fight me. We offered it to him. We asked him: ‘Come to ’35.’ He turned it down. We knew he was scared. UFC on ESPN +1 is just a couple of nights away, with the anticipation for the event is growing by the minute. Dillashaw plans to secure a legacy with a win over Cejudo while the latter will be looking to retain his flyweight belt, in what will be his first title defense since his championship win against Demetrious Johnson at UFC 227.
Who do you think will walk out of the Barclays Center, on Saturday night, as the latest addition to the 'double-champion club?' Cejudo? Dillashaw? Be sure to leave us with your early predictions in the comments section below!